2. 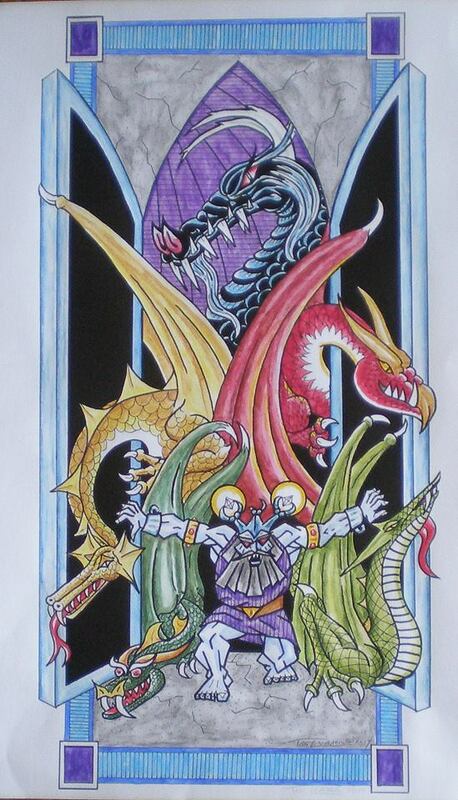 This illustration is from the second commission, the Ancalagon Triptych. 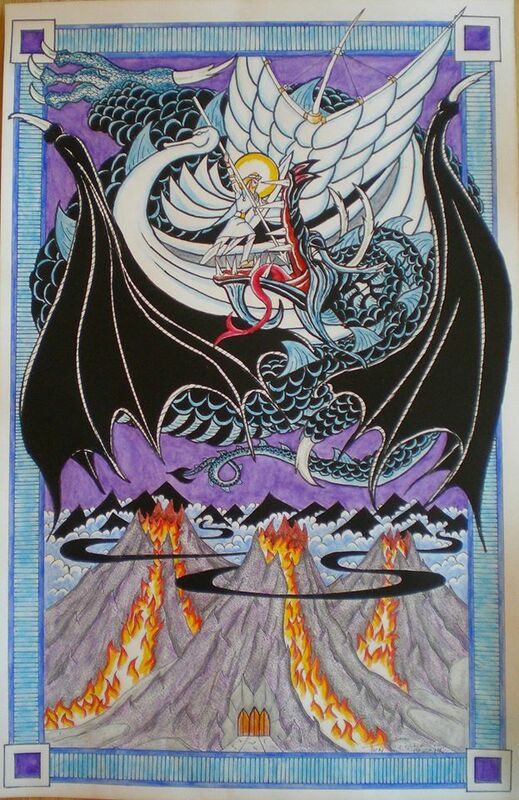 Its the 1st panel of three depicting the Great Battle of the War of Wrath that ends War of the Jewels and the first age of Tolkien’s Middle-earth when the Gates of Angband open and Morgoth releases the winged Dragons led by Ancalagon the Black, greatest of all Dragons. As told in The Silmarillion, all the free peoples of the west of Middle-earth have been utterly defeated by the Great Enemy, Morgoth. Most have been killed and much of the remnants enslaved.An embassy by the Half-elven Eärendil to the Valar in their land West succeeds in gaining their intervention and they raise a Host of the Elves and Maiar to free Middle-earth. Morgoth’s armies in the field are destroyed and he is besieged in his fortress of Angband. In desperation, he sallies forth with a fleet of winged Dragons, driving back the Host of the West. 3. 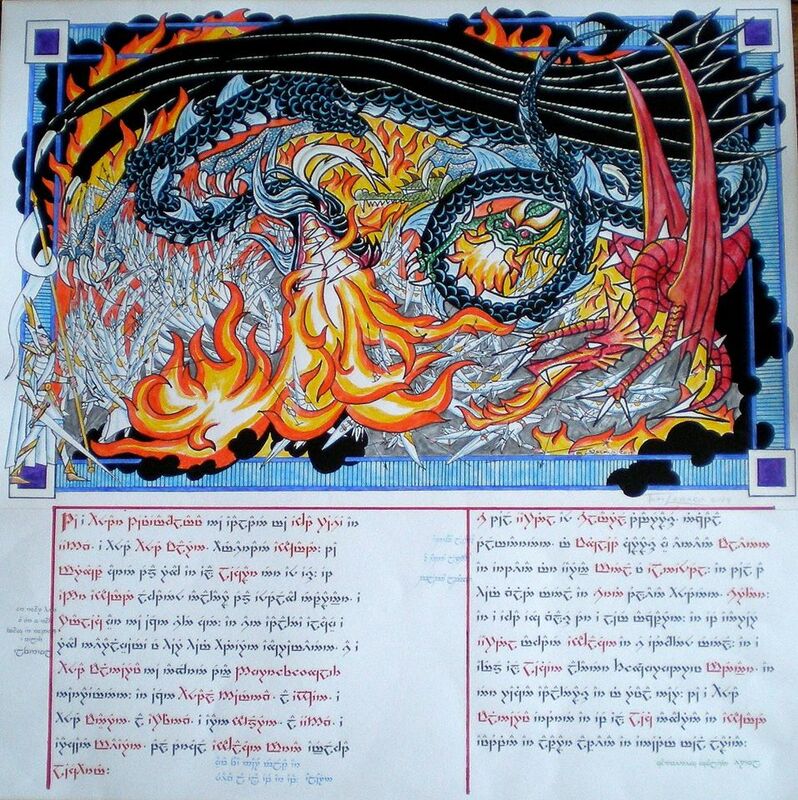 The third and final panel of the Ancalagon Triptych shows the climactic single combat between Ancalagon the Black and Eärendil the Star of Hope. Eärendil, one of the half-elven and son of the Man Tuor and the Elf-maid Idril sailed west to plea for aid against Morgoth. His plea was heard and the Host of Valinor went to Middle-earth to overthrow Morgoth, the Great Enemy. However, Morgoth’s last stroke, the assault of the winged Dragons drives back the Host of the West. Eärendil, who the Valar had set in the sky as a star with his ship and a holy Silmaril jewel on his brow, returns to Middle-earth and contests the battle in the sky with Ancalagon, and casts the Dragon down. In his fall, Ancalagon breaks the triple peaks of Morgoth’s fortress of Angband. (Quenya translation by Ryszard Derdzinski)"